Doha, 25 July 2018 - Qatar Insurance Company (QIC), the leading insurer in Qatar and the Middle East North African (MENA) region, announced its financial results approved by the board for the first half of 2018. In H1 2018 QIC Group recorded growth in Gross Written Premium (GWP) of 5% to QAR 6.6 billion. This performance reflects the steady and systematic expansion of QIC Group’s international operations, which has further expanded in select low volatility classes. The MENA markets continued to generate stable premiums and underwriting profitability, weathering unabated geopolitical headwinds. Against this backdrop, the Group reported profits to the tune of QAR 384 million, representing 91% of the full year 2017 profits. Investment Income has dropped from QR 563 million in H1 2017 to QR 408 million in H1 2018. The 27% y-o-y drop in investments income can be mainly attributed to certain one off investment gains booked in H1 2017. Further reclassification of certain types of investment securities post adopting IFRS 9 from 1st Jan 2018 resulted in increased mark to market losses in H1 2018. The Group’s net underwriting result increased by 26% y-o-y and amounted to QAR 330 million compared with QAR 263 million for the same period last year. 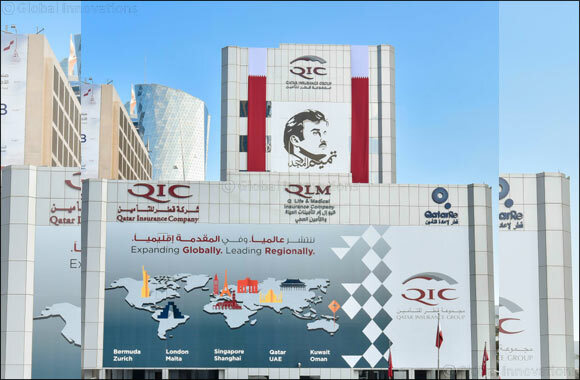 QIC, in the previous quarter, recorded negative reserve developments on some older contracts in areas of business that are no longer within the company’s risk appetite and have been discontinued accordingly. In addition, QIC continued to apply its recently adopted strengthened reserving governance and philosophy, resulting in a more cautious view of ultimate loss projections and a slower release of prior-year IBNR reserves. Low-severity high frequency business now accounts for about 43% of QIC’s total underwriting portfolio. During the reporting period, QIC further improved its already exceptional operational efficiency. In the first half of 2018 the administrative expense ratio for its core operations came in at 6.3%, down from 7.9% in the same period of the previous year. The Group continues to reap the benefits from its ongoing endeavor towards process efficiencies and automation. In the same context of operational streamlining in June 2018 the Group announced its intention to suspend the writing of all new and renewing facultative business from Qatar Re’s branch office in the Dubai International Financial Centre. Distribution throughout the MENA region will continue to be provided by the QIC Group’s existing operations in Doha, Dubai, Oman and Kuwait. Earlier in July 2018, Standard & Poor’s affirmed QIC’s financial strength rating of A/Stable, referring to the Company’s “strong business and financial risk profiles, its scale, diversified premium base (by geography and product), and ability to post good results”.